Request a quote for a bulk order for EZH2 monoclonal antibody - Classic. Please fill out the form here below. Your local sales account manager will get in touch with you shortly and send you a quotation based on your requirements. Monoclonal antibody raised in mouse against the central part of the human EZH2 protein (Enhancer of zeste homolog 2). 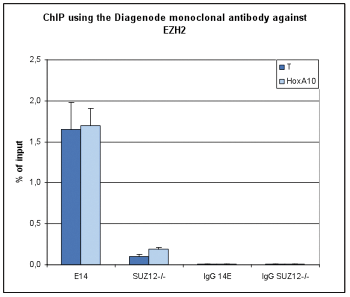 ChIP assays were performed using 2.5 μg of the Diagenode monoclonal antibody against EZH2 (Cat. No. MAb-180-050) on sheared chromatin from 5 million E14 mouse embryonic stem and from SUZ12-/- cells, used as a negative control. IgG was used as negative IP control. Quantitative PCR was performed with primers specific for the HoxA10 gene and for the T gene which encodes the Brachyury transcription factor. Figure 1 shows the recovery, expressed as a % of input (the relative amount of immunoprecipitated DNA compared to input DNA after qPCR analysis). Diagenode strongly recommends using this:	EZH2 monoclonal antibody - Classic (Diagenode Cat# C15200180 Lot# 001). Click here to copy to clipboard.